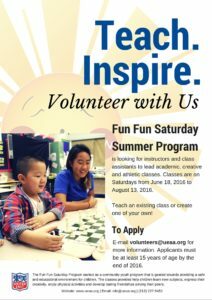 You are here: Home / Fun Fun Saturday / Volunteer with us this summer! Fun Fun Saturday Summer Program is looking for instructors and class assistants to lead academic, creative and athletic classes for children ages 7 to 15 years old. Volunteers have the opportunity to teach an existing class or create a new one. Past volunteers have led exciting classes such as American Sign Language, Intro to TV Production, Junior Engineer and Ping Pong. Classes will run on eight Saturdays from June 18, 2016 to August 13, 2016. If the chance to teach a class interests you, apply today! Email [email protected] by May 3, 2016 for more information.